Isabella Alden was particularly close to her niece, Grace Livingston Hill. Grace was a writer, too, and her books were incredibly popular and are still widely read today. But Grace wasn’t merely a best-selling authoress; Grace was also a teacher. She was dedicated to teaching Sunday-school classes at her church, and when her daughters Margaret and Ruth were old enough to attend school, Grace decided to teach them at home, just as her parents had taught her. Grace’s desire to teach wasn’t limited to her family. For years Grace ran a Bible class for children at a nearby Presbyterian church. She was the guiding spirit in establishing a mission Sunday School for immigrant families, and she personally paid to send innumerable young people to Pinebrook School, a well-known Christian Bible conference in the Poconos. 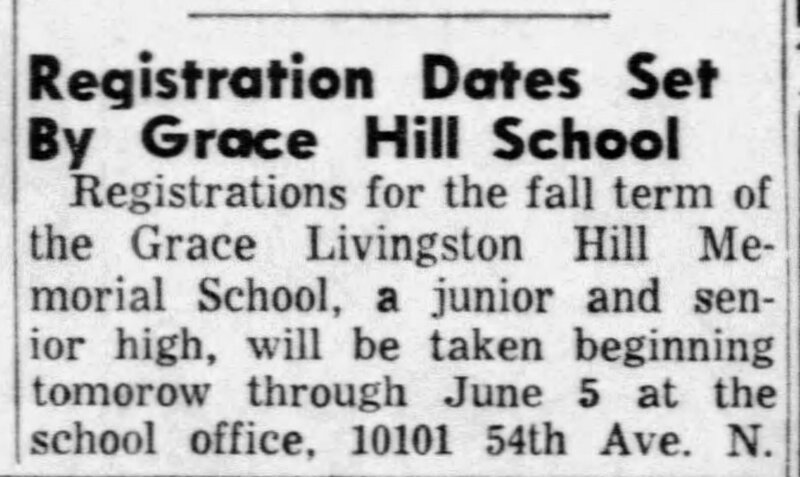 Notice of class registration for Grace Livingston Hill Memorial School; from the Tampa Bay Times, May 20, 1954. Education was something Grace was passionate about, and when she passed away in 1947 her daughter Ruth Hill Munce took steps to honor Grace’s teaching ministry. Ruth purchased a 30-acre site in St. Petersburg, Florida and built a school, which she named after their mother. 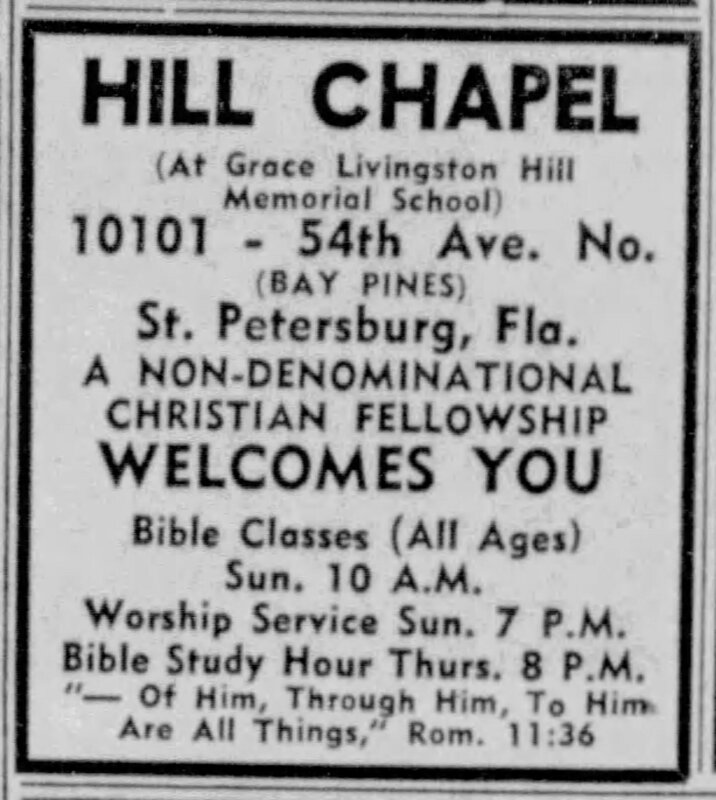 An ad for Sunday services at Grace Livingston Memorial School chapel. From the Tampa Bay Times, October 22, 1955. 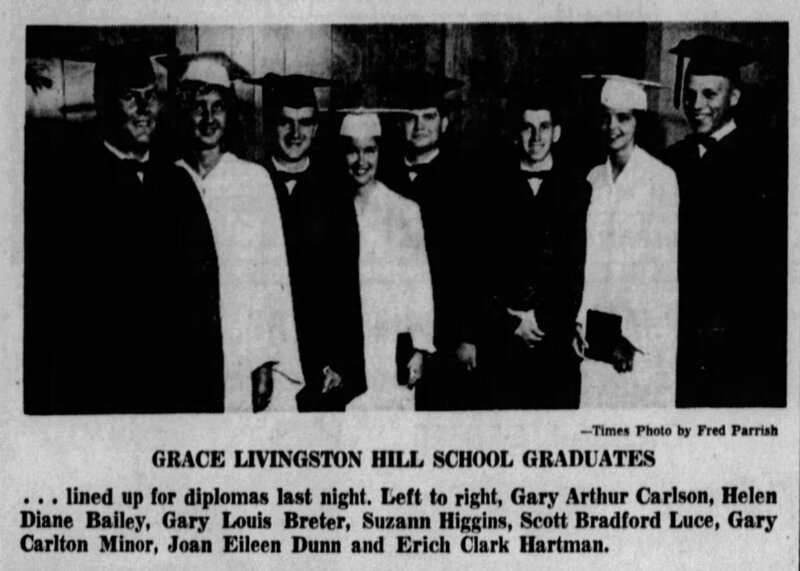 Grace Livingston Hill Memorial School graduates, class of 1961, from the Tampa Bay Times, June 7, 1961. In 1962 the school changed its name to Keswick Christian School, and it’s still operating today under that name. But it had its roots as a tribute to Grace Livingston Hill, who loved God and used her talents for writing and teaching in order to serve Him. You can read some of Grace’s short stories for free on this site. Just click on one of the images below to begin reading. Grace Livingston Hill, Isabella’s niece, is often credited with creating the Christian romance novel, but in her early writing days Grace wrote and published many short stories. 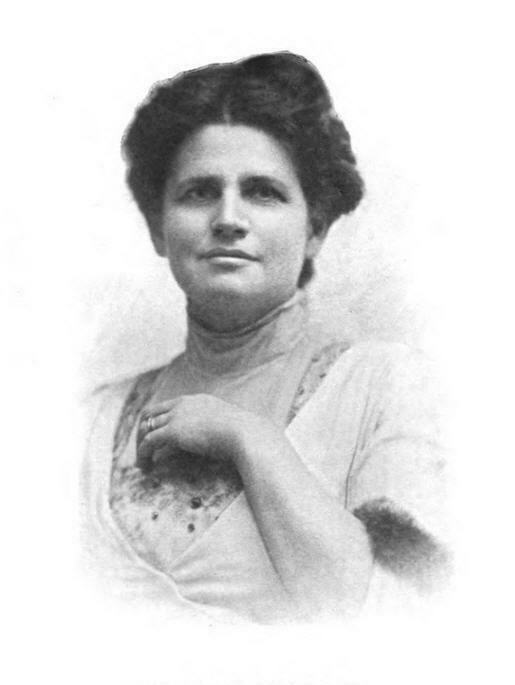 She was just 28 years old when her story, “Beginning at Jerusalem” was published in Home Missionary Monthly magazine in 1893. Now you can read Grace’s heartwarming story for free. Just click on the book cover to begin reading.